On most Tuesdays mornings, at 11:30 or so, four people gather in Melanie Modlin’s office for a 30-minute discussion that generates the content for one of the NLM’s newest and most successful communication outreach ventures. These are the unseen faces behind NLM’s main Facebook page. They huddle for a half hour considering possible Facebook postings for the week. Sometimes there is a news hook, such as an announcement on breast cancer research, or a celebrity health angle, such as singer Sheryl Crow’s recent benign brain tumor announcement or “Good Morning America” (ABC-TV) co-host Robin Roberts’ revelation that she has a rare bone marrow disorder called MDS. Modlin, Deputy Director of the Office of Communications & Public Liaison (OCPL), Yani Yancey, Outreach Librarian, OCPL Social Media head and co-chair of the NLM-wide Social Media Engagement Committee, Public Affairs Specialist Nicole Irby and Program Support Assistant Allison Fisher constitute NLM’s Facebook editorial group (shown from left to right: Modlin, Irby, Fisher, Yancey). Their first task is to review a master list of annual health observance and recognition dates, with call-outs for the special months and days. For example, all of April is Autism Awareness Month, May 10th is World Lupus Day, National Celiac Disease Awareness Day is September 13th, and July is Eye Injury Prevention Month. The group chooses from a dozen or more listings for each month to post about. Here experience and insight combine to hone the selection process. Modlin is a graduate of the University of North Carolina at Chapel Hill who joined NLM in 1996. Yancey, hired full-time in 2011 first came to NLM as an Associate Fellow in 2009, and brings a special interest in social media to the discussions. Fisher, an NLM intern in 2010, earned a BA in communication from the University of Maryland, College Park, in 2011, and is beginning studies this summer for a Masters in Library and Information Science from Syracuse University. Irby earned her MA in Organizational Communication from Bowie State University in 2005, and joined the NLM in July 2011 upon graduation from the NIH Management Intern Program. Together they update and respond to comments on NLM’s Facebook page, which began in 2010 with the goal of presenting lively, online health posts. Irby recalls a posting for World Lupus Day that turned out to be one of the page’s most popular, with 40 likes and 30 shares. The lupus post was particularly timely because it was Lupus Awareness Month and that, combined with World Lupus Day, generated high interest—when most of world media had ignored World Lupus Day. This illustrates one of the great advantages of Facebook: you can post and connect with your audience almost instantaneously, while traditional media is bound to the daily news cycle. And there are other advantages to using social media, according to Yancey. The NLM can identify and target its wide, audience of health professionals, researchers, journalists, librarians, and the general public. 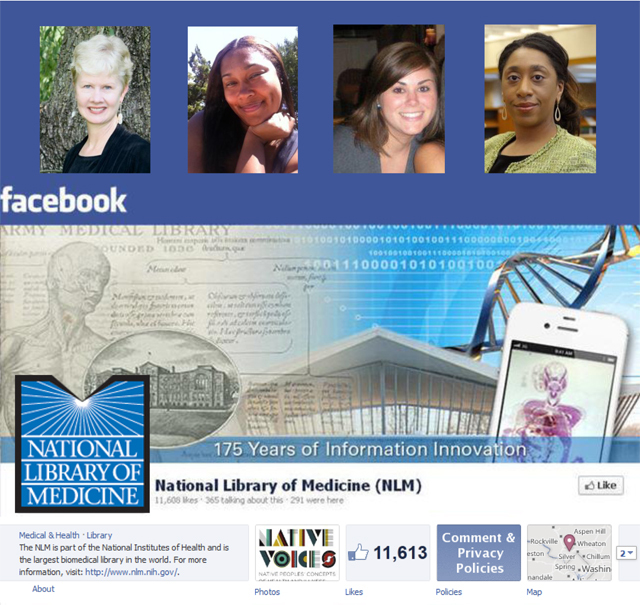 At this writing, NLM’s Facebook has more than 11,600 likes and grows by an average of 13.7 new likes per day. The majority of NLM Facebook followers are women, but more men are joining (55 percent female, 43 percent male). Some 75 percent are ages 18-44, 28 percent list English as their primary language, and the highest number of followers are in the United States, followed by India, Egypt, Mexico and Pakistan. The NLM Facebook page first launched on February 16, 2010 with a posting about a new exhibition to open soon: “Within These Walls: Contraband Hospital and the African Americans Who Served There.” By March 20, the NLM Facebook page had 1,000 followers. Two years later, there were 10,000. NLM’s Office of Communications and Public Liaison manages the NLM Facebook page and NLM’s general-interest Twitter feed, @nlm_newsroom. There are many others ways people can connect with NLM to get the latest on the Library’s products, programs and services. June 18, 2012 in Products.